FILE - In this Oct. 22, 2018, photo U.S. Immigration and Customs Enforcement agents surround and detain a person during a raid in Richmond, Va. The officers suit up in the pre-dawn darkness, wrapping on body armor, snapping in guns, pulling on black sweat shirts that read POLICE and ICE. U.S. Immigration and Customs Enforcement's enforcement and removal operations, like the five-person field office team outside Richmond, hunt people in the U.S. illegally, some of whom have been here for decades, working and raising families. Under President Donald Trump, who has pushed hardline immigration policies, ICE has been exposed to unprecedented public scrutiny and criticism, even though officers say they're doing the same job they did before the election — enforcing U.S. laws that were on the books long before 2016 and prioritizing criminals. FILE - In this Feb. 7, 2017, photo released by U.S. Immigration and Customs Enforcement shows foreign nationals being arrested during an operation conducted by U.S. Immigration and Customs Enforcement (ICE). FILE - Detainees are seen at the Adelanto immigration detention center, run by Geo Group Inc, in Adelanto, California, April 13, 2017. "You need some kind of agency to deal with immigration, but ICE is not that," New York City Mayor Bill de Blasio, a Democrat, said on radio station WNYC. "ICE's time has come and gone. It is broken. ICE has been sent on a very negative, divisive mission, and it cannot function the way it is." 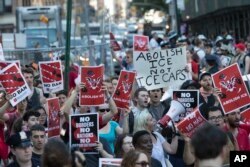 FILE - Protesters chant slogans as they march during a demonstration calling for the abolishment of Immigration and Customs Enforcement, or ICE, and demand changes in U.S. immigration policies, June 29, 2018, in New York. "I didn't do anything," said the man, who spoke from Mexico but did not want to be identified because he fears for his family. "I am a hardworking person. I am not a criminal. I don't understand." They split up into two cars and drive over to his apartment. It's pitch black. They wait. The radio crackles. An officer says someone has left but it's so dark it's impossible to see who it is. Lights flash. It's not who they're looking for; it's a woman. They send her on her way. The officers are jittery, thinking the mistake spooked the target. They wait.